2017 Legislative Breakfast a Success! 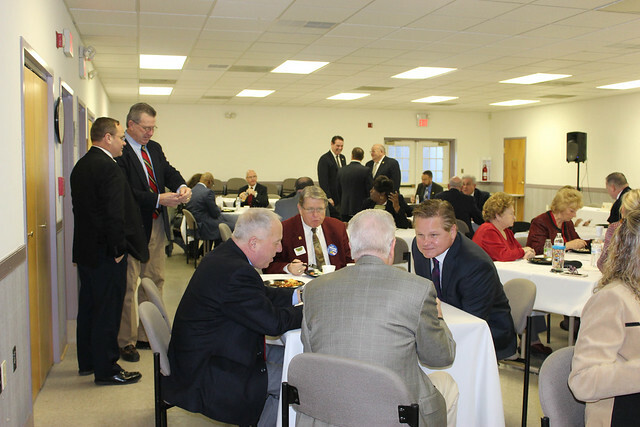 On February 13th, the SMAR Legislative Committee was honored to host the Southern Maryland Delegation for breakfast covering top realtor issues such as our opposition to current SB266/HB481 Septic System Legislation and instead, our support for Delegate Matt Morgan's alternative option with HB537, which provides homeowners a better financial option for region's strongly affected by septic laws such as Southern Maryland. We also covered first time home buyers savings account, open house legislation, key transportation priorities and fast tracking tax assessment appeals and foreclosure cases in the courts. As today (Feb 13) is also the last day for public record submission in the Charles County Planning Commission proposed down zoning to a watershed district, we provided the delegation with an update to our efforts and partnerships. To that extent, we are pleased to share with you the support letter below, which was submitted along with our hundreds of opposition letters, data, research and testimony against the confiscation of 9,500 properties in Charles County. Thank you to fellow REALTOR® and SMAR member Delegate Matt Morgan, Delegate Deb Rey, Delegate Susie Proctor, Delegate Edith Patterson, Delegate Mark Fisher, Delegate Gerald Clark and Delegate Michael Jackson for your bipartisan support for Southern Maryland property owners rights. We have an uphill battle and the support of our elected officials will only help us move forward as a united front.